Ensuring the viability and promotion of the Huddersfield Narrow and Broad Canals as navigable waterways within the overall network in perpetuity. The Huddersfield Canal Society was formed in 1974 by a group of enthusiasts with the ambitious aim of restoring the then derelict Huddersfield Narrow Canal to through navigation and improving the Broad Canal. After 27 years of campaigning and restoration, led by Canal Society volunteers, the Narrow Canal was re-opened in May 2001 and gained Royal approval with an official ceremony by HRH Prince of Wales in the September that year. Funding for removal of the final set of major blockages, amounting to £30 million, was received from the Millennium Lottery Fund and English Partnerships, with contributions from the Society, Tameside, Oldham and Kirklees Councils and the former British Waterways. Click here to download Keith Gibson’s historical summary of the restoration and follow this link to see how the major blockages were removed. The Society’s members and volunteers help protect and promote the canals so the years of hard work and investment can continued to be enjoyed by all. 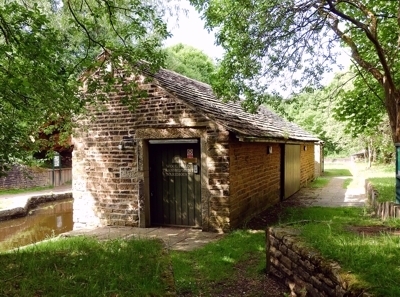 The Society’s offices are idyllically located at Wool Road, Dobcross, in a former Lime Shed constructed by the Huddersfield Canal Company in 1820. It was saved from dereliction by the Saddleworth Historical Society during 1979 and refurbished by the Canal Society in 1993, winning environmental awards for the work. The Society acquired the premises in 2006, where its staff are based. If you would like to come and see us, please call to make an appointment as we may not always be in. The nearest railway station is Greenfield and bus services from Manchester and Huddersfield pass by. There is a free car park on the opposite side of the canal to our building. Walk out of the car park, turn left, cross the road bridge and turn left down the signed track. Or come by boat!